A brief rundown of the various model kits available of the TSR2. 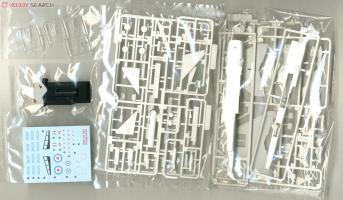 Released in 2010, this is a white metal kit which can be bought as a basic kit, or ready built (at a substantial price premium). The kit is made up from a top half including the wings and upper fuselage and a bottom half that makes up the majority of the airframe and tailplane, with a separate fin. Remarkably neat undercarriage and doors are provided, with rubber tyres too (including one spare for each of the main and nose wheels). A short section of brass rod is also included, to be used to make up the tie rods fitted to XR219 for its final few flights (and also found on XR220). Decals are provided for XR219, XR220 and XR222 and consist of national markings, serials, walkway lines and warning triangles as well as decals to represent the large equipment bay doors, airbrakes, flap markings (though these are really specific to XR219) and the cockpit canopies. In terms of accuracy, this is a pretty good effort. Scale-wise it works at to a wing span of about 36 ft and length of 84 ft or so - compared to 37.14 ft and 89 ft respectively for the real thing. There are some subtle control surface details and a basically good overall shape. The tailplanes have no anhedral, but this is easily remedied by bending them down at the root. The rear fairing between the engine exhausts is missing but can be built up with a bit of Milliput or similar. The underside of the nose curves upwards a bit too much, but again some judicious bending can pretty much fix this if it bothers you enough - though it will open up a bit of gap between upper and lower fuselage halves that you'll need to fill. 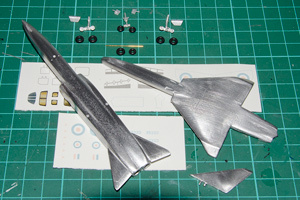 Once sanded/polished to remove any surface imperfections the model flies together with just a small amount of filler needed around the fuselage join. On my example I found the belly surface needed some additional filler to remove some miniscule holes and give a smooth surface for the paint but generally this is a nicely cast model and certainly looks the part once completed. Easily taking the crown as the best 1/144 kit available (and possibly best TSR2 kit in any scale), Pit Road have produced a superb little model that is nicely detailed, well engineered and accurate. The fuselage in particular is cleverly broken down to allow for lots of detail to be included in the weapons bay and undercarriage bays, and slide moulding has been used to enable even more detail to be packed in. In this release decals are included for the development batch aircraft XR219, XR220 and XR222, with XR219's flap markings included as decals along with walkway markings for the tailerons - but not the main wing. The intake camera pods for XR220 are supplied as clear parts. Unusually the kit also includes a display stand. The kit has since been re-released by Great Wall Hobbies, with no changes as far as I'm aware. Another release of the superb Pit Road TSR2 kit, this time including decals for some 'What if?' 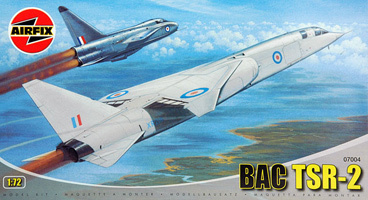 aircraft - a camouflaged 12 Squadron example plus a 208 Squadron jet in a black display scheme. This time walkway markings are included for both rear stabilisers and the mainplanes. The plastic is the same as the previous release but an additional sprue is included with parts for a large belly tank (though this was really only intended for ferry use) and four Martel missiles with pylons. Sometimes to be found on Amazon cheaper than the prototype release of the kit, which makes it a bit of a bargain. 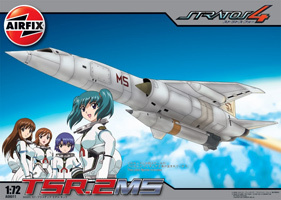 Another release of the superb Pit Road TSR2 kit, this time including decals for the Manga series Stratos 4 'TSR2.MS' meteor sweeper craft. 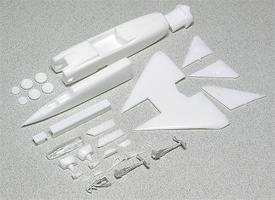 Same plastic as the original kit with some new parts to cater for the MS conversion - belly and underwing rockets and a new tail with rocket, also new canopies and prone pilot cockpit. 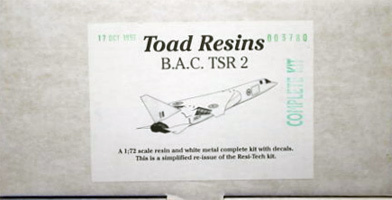 If you're interested in actually building a normal TSR.2, you can do so from this kit but will need to source decals elsewhere. Cafe Reo are a Japanese firm and produce a series of "BigBird" volumes which are basically pre-painted and partially assembled models randomly put into boxes for each volume. Each volume has a 'secret' aircraft which appears in a minority of boxes. 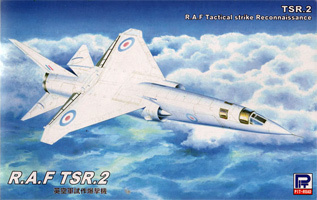 Volume 2 of the series included a TSR2 as the secret aircraft, so it is a bit of a rarity. Some eBay sellers break up the original boxes and sell the individual aircraft so they can be found from time to time on eBay for a fairly reasonable price. Unfortunately the alleged rarity value means some sellers set laughably high prices. As to the model itself, it's one worth avoiding sadly. There are some serious shape issues, with the intakes too bulky and swept up at the bottom, a bizarre hump in the fuselage above the intakes, nose too fat and windscreen too proud. Nose wheels too small and the gear looks a bit too far forward. These models are pre-painted and need minimal assembly, but do come with a decal sheet with which you complete it by applying your chosen serial number (XR219, XR220 or XR222) and various other small markings. An interesting little curio if you can get hold of one cheaply but that's it. Very rare now, this was a fairly basic resin kit with vacform transparencies and white metal landing gear and doors. Packed in a stout box with bubble wrap to protect the parts, the vacform canopy was not bagged seperately and thus vulnerable to being scratched. The resin parts are for the most part decently cast but the white metal parts need a good bit of cleaning up. There is some nice recessed detail on the wings, but the fuselage is rather bare. No decals are included. Instructions include basic plans and some detail pictures but no assembly diagram as such - not an issue as the plans make it obvious what goes where. The fuselage on my example was rather banana-shaped and needed substantial work to correct it though apparently not all of them are like this. I also found the taileron parts mismatched with one thicker than the other. Building the kit is a matter of careful checking and fettling of parts and much use of filler. White metal ejection seats are included which populate the cockpits nicely, and the vacform canopy looks spot on and clear enough to reveal any detail you may try and add to the cockpits. There are several accuracy issues; the prominent exhaust vents in front of the wing root are missing; the flap actuator bulges under the wings are in the wrong place and the fuselage and nose shape is rather off (not helped by the work needed to get it all straight). However the dimensions are mostly spot on - just the wingspan being about a scale foot shorter than it should be. A resin kit (with white metal undercarriage and dry transfers) that is sadly best avoided. 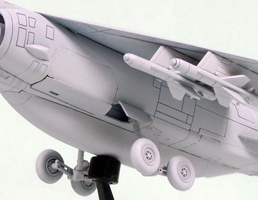 The kit is dimensionally inaccurate in various ways - fuselage too short, wings too large, wing tips droop at the wrong angle, ejector seats far too small, undercarriage too large etc. The end result is a caricature of the real thing, which is a real shame as the parts are nicely detailed and generally well cast. It was discontinued by the manufacturers in fairly short order so is becoming difficult to get hold of but frankly why would you want to get hold of one with the far superior Pit Road kit now available? A bold step into the unknown at the time, Airfix very cleverly issued this kit as a limited edition and it promptly sold out. While not up to current Airfix standards, it's still a decent kit but is a rather challenging one to build well. 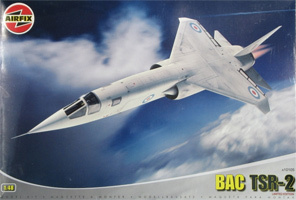 Decals are provided for the usual three development batch aircraft, XR219, XR220 and XR222, with a detailed bomb bay including the instrumentation packs carried by these airframes. The intake-side cameras on XR220 are also included. In general the recessed surface detail is nicely done, the weapons and gear bays have some decent detailing and the cockpit is a fair stab at representing the real thing. Dimensionally the kit is accurate and has no shape issues to complain about at all. Where it falls down is in terms of fit - in particular with the wing to fuselage joint, the entire intake area and all of the various gear and weapons bay doors (the kit is most definitely engineered to 'let it all hang out' and building it as an 'in-flight' model is even trickier). As a minor point, the bonker plates on the wing tips and tailerons need to be sanded off if you are to represent XR219 - a common fault with TSR2 kits as the preserved examples include these plates but XR219 never had them. 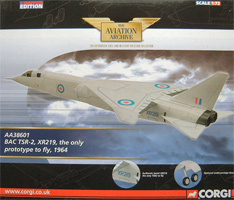 The kit was also produced at a time when Airfix were experimenting with different decal producers and the decals are not the greatest, with areas that should be solid colour exhibiting obvious stippling where poor printing techniques have been used. 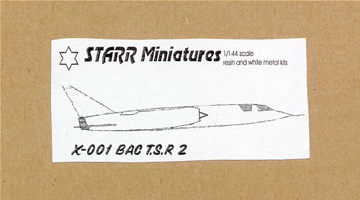 However, if you want a basically good TSR2 kit in 1/72 scale, this is the one to go for regardless of fit and decal issues - it just needs some good old fashioned modelling skill. However, don't go hunting for one of these rarities... there's a better option - read on! 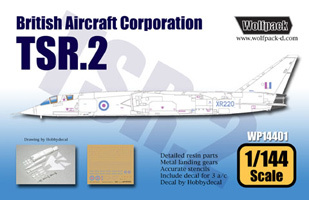 Various third party manufacturers have issued resin and etched brass updates for the Airfix 1/72 TSR2; some of these items are absolutely superb, some are utter rubbish. Among the more impressive bits are those issued by resin manufacturer CMK - including intake and jet pipe covers, detailed weapons bay, cockpit, undercarriage, etc. The Eduard etched sets are far less useful and not very accurate. Freightdog Models have issued some very nicely cast resin weapons sets (e.g. Blue Water missiles) - these and most of the CMK sets are the only ones I would personally recommend. 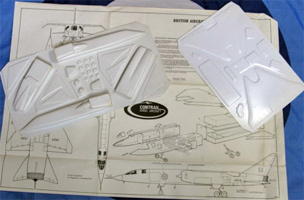 Despite appearances, this is the Airfix TSR2 kit once again! 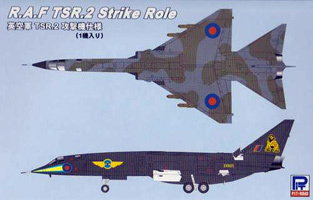 One of the reasons for its popular in Japan is that the TSR2 was adopted by Anime cartoon makers as a 'Meteor Sweeper' in the 'Stratos 4' series. 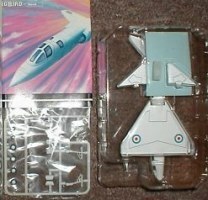 Airfix cottoned on to some serious extra sales and have re-issued their TSR2 kit in this Stratos 4 guise. 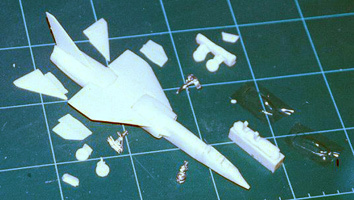 You can still build the same development batch aircraft as provided for in the original kit (and the decal sheet is far superior to the original issue), but additional parts are provided to enable the TSR2MS to be built. These include a new solid canopy and cockpit insert with female crew members (riding jockey style!) and a huge booster rocket to launch the aircraft without using runways. All a bit bonkers but as it has made the kit available with improved decals, good news for modellers! Not a kit but a diecast model, Corgi have released this three times now, as the usual suspects - XR219, XR220 and XR222, the models differing only in the serial numbers applied (and XR220 gaining cameras on the intakes sides too). The overall shape is good and while the panel lines are done in the usual heavy Corgi house style, the overall effect isn't too bad. The model generally looks the part and is certainly a heavy chunk of metal! A hefty - and ugly - stand is included, but if you want to pose the jet on its wheels you can do that too. A nice touch is that the main undercarriage bogey actually rotates so it can be posed in-flight with the gear dangling at around the right angle. Of the three releases, the ones of XR220 and XR222 are strictly speaking the more accurate ones, as the model includes bonker plates on wingtips and tailerons; these weren't on XR219 in real life. This was a pretty good resin kit with various white metal and etched brass bits to detail it. From what I have seen of built-up examples it is generally a fairly good representation of the real thing, though not as accurate as the Airfix kit; the undercarriage looks a little too chunky, as does the main wing, and the radome and windscreen shapes look a little off. Nothing that would be impossible to fix, and the surface detailing is very nicely done and in some ways superior to that of the Airfix kit. The decals are a bit of a dead loss, with an incorrect shade of pink used throughout, solid pink walkway lines (instead of dashed) and minimal stencil coverage. 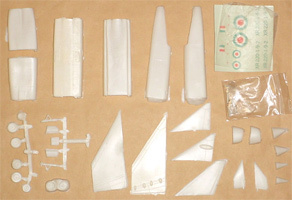 The kit has been issued in various guises over the years by various companies (Resitech / Toad Resins / Swan Model Engineering / Cloud 9 / Aardvark / Heritage Aviation Models), with variable quality (and simplified somewhat from its original release), though it is now only available second hand. The etched brass fret is currently still available from Heritage and includes a couple of boarding ladders - so that's worth getting hold of. An ancient short run injection moulded kit, consisting of parts that might look vaguely like bits of TSR2 in poor light or if you have cataracts. There are absolutely no redeeming features in this box of horrors, and it should be avoided at all costs. In 2011 a shop in the US was reportedly selling off stock of these at $4.95 each; they were still overpriced. Having said that, it is at least marginally easier to build than the Contrail monstrosity (below) and the shapes are a little better too, so it gets one star for that. This is not a recommendation of any kind - avoid! An ancient and very crude vacform kit that is still readily available second hand. This is primarily because it looks so unlike a TSR2 that most people who bought it took one look in the box and then slung it into a cupboard hoping never to see it again. Years later during spring cleaning these awful kits see daylight again and are promptly stuck on eBay, where the more hapless sellers tend to think they are worth something on the basis that they are a) old and b) have TSR2 written on the box. They are wrong. There isn't a single part that is accurately shaped and the intakes, fuselage and nose are so deformed as to be laughable. The kit has been sold both bagged (very early issue) and boxed; it sometimes does not include parts for the undercarriage legs (which you have to scratch build), or decals, though some boxings do include some fairly hopeless injection moulded undercarriage parts and a basic decal sheet of roundels and serials only. Avoid! This is a free to download set of drawings for a 1/72 card model. It doesn't replicate the slab-sided appearance of the forward fuselage, the markings are the wrong colour and many are missing and the main wing position is wrong being too far aft. Still, a pretty good stab at a complex shape and it is free so you can hardly complain! A high quality vacform kit that used to be good value but with the collapse of the exchange rate, now a ridiculously expensive proposition. It does however pop up on eBay from time to time and usually goes for a much more reasonable price. The kit includes a substantial amount of white metal parts, covering undercarriage and cockpit detail plus various vents and scoops and the rear fairing between the jetpipes. Everything else is vacform plastic, with mostly nicely done recessed detailing and a spare canopy assembly should you muck up cutting out the first one. In terms of accuracy this is streets ahead of the Airfix 1/48 kit in terms of overall shape, exhibiting none of the fuselage and nose shape issues that the Airfix kit suffers from. However, the surface detail on the Airfix kit is crisper and in places more accurate. The Dynavector decal sheet provides for the usual suspects (XR219 and XR220) but is reportedly not up to Dynavector's usual quality, with the decals taking substantial soaking before they release from the sheet. 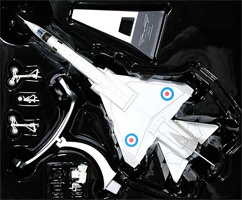 Overall then, if an accurate TSR2 is your goal, you're better off starting from the basis of the Dynavector kit - its faults are small but it is a challenging build, and the Airfix kit is undoubtedly a lot easier to put together. Perhaps a mixture of the two is the answer... wallets out! 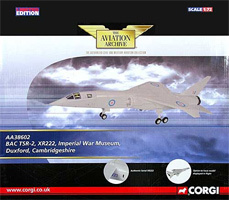 With the 1/72 kit having sold incredibly well, Airfix finally came out with a 1/48 version and once again touted it as a 'Limited Edition'... this time, however, the kit buying public were a little less keen and it is still relatively easy to get hold of the kit though it is no longer being produced and is sold out at many retailers. Unfortunately while the kit shares much of its detailing and parts breakdown with the 1/72 kit, it loses out on accuracy. Everything is pretty OK from the jetpipes to the wing (though the fin is missing the cooling intake) but once you reach the intakes the fuselage width is off and it slopes inwards towards the nose whereas the real thing does not. Correcting this is a lot of work! There is also a pronounced hump on top of the wing; this is much less obvious on the real thing, and shaped differently to boot. The angle of the main gear legs is also wrong and this is another tricky item to fix. Smaller problems are evident in the cockpit with wildly inaccurate instrument panels, coaming and a windscreen that doesn't want to sit right. The nose cone does not fit properly. Built 'out of the box' you do get something that looks very much like a TSR2 but if you really care about the subject it's hard to look past the problems. Such a shame after the basically accurate 1/72 kit - if only Airfix could have just upscaled that and sorted out the fit issues! Another ancient and crude vacform kit that is still readily available second hand like it's 1/72 cousin. While the outline accuracy is improved very slightly over the smaller version, it is still deformed looking and very basic indeed. Compared to either of the Airfix or Dynavector kits in this scale, it is clearly the loser. It has been reboxed by Sanger in the USA; the kit was not improved in any way when this happened. Another one to avoid like the plague. Another card model, this time in the rather odd choice of 1/33 scale. It's clearly a model of XR220 only with serial markings printed on the card and the intake-side camera fairings. The overall shape appears to be very good indeed with some great attention to detail resulting in the inclusion of items such as the parachute cable guide track. No bomb bay or electronics bays but there are good cockpits - albeit in the wrong colour. A few exterior markings are also in the wrong colour. Some panel lines are wrong e.g. refuelling probe fairing blanking plate is on both sides of the nose instead of port side only. Overall, though, a most impressive model which is a credit to its designer. Rather pricey though! 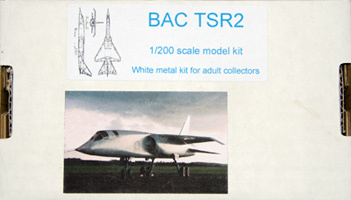 No other TSR2 kits appear to be available in the larger scales. Given how huge it is in 1/48, this is not surprising! There are some scale plans available for larger models but these tend to be for radio control flyers, and usually include changes such as a larger wing to give easier flying characteristics.